Sung texts with English translations (except Barber). Now, when he issues his first solo album he has again, as in the first Walküre, Asher Fisch as conductor. He knows his Wagner inside out and Skelton is as reliable as ever. Possibly there is no better Wagner tenor around at present. He delivers unforced singing, beautiful tone, strength, brilliance and natural phrasing. His enunciation is also exemplary. The five solos here are gems that also work well isolated from the opera itself. Rienzi’s prayer is without doubt the best known number from Wagner’s early opera and here the singer and his audience can really wallow in strong feelings and high Romantic sonorities. It is, as Robert Gibson says in his commentaries, a rarity in the world of opera with a prayer sung by a male character “as they are more usually the preserve of pious, but ultimately doomed, women.” Skelton tones down his magnificent voice for a sensitive, inward reading of Lohengrin’s In fernem Land, challenging singers of the past like Jess Thomas and James King. Of present day singers only Klaus Florian Vogt is in the same league, but his voice is of a different character, leaner, Tamino like. Winterstürme from Die Walküre is a well-known quantity for Skelton and he sings it with a rousing feeling of spring. The two excerpts from Parsifal are permeated with less overt feelings, more sermon-like, in particular Nur eine Waffe taugt, sung with steady tone, soulful and honest. Few tenors have ventured into the Wesendonck songs, which have remained soprano territory. Melchior recorded two of the songs in the 1940s and René Kollo set down all five in 1992, when he was in his mid-50s and had lost much of beauty of tone and steadiness he had in the beginning of his career. His readings still had a lot to offer in insight and expression but should have been recorded much earlier. It is a pleasure to hear the songs with Stuart Skelton, still at the height of his powers and with depth of insight to match. Der Engel is soft, beautiful and with a hushed intensity. Stehe still is eager and deeply lyrical – and he certainly sings off the words. Im Treibhaus is deeply involved, intimate, personal. It’s a remarkably gripping reading. Schmerzen is just glorious, while Träume is quite magical. It is indeed fitting that he sings this song now, having of late been very much in demand as Tristan. Träume is a kind of blueprint for the Tristan music. The non-Wagnerian fillers are surprising but definitely utterly attractive. Charles Griffes, who died only 35 years of age during the worldwide influenza pandemic in 1920, wrote numerous songs. The three recorded here were composed in 1918 and orchestrated the following year. The tonal language is late romantic tonal and easily accessible. As always Stuart Skelton wrings every drop of feeling out of the texts and the music. Samuel Barber is better-know and his songs are a goldmine. Sure on this shining night was composed in 1938 and has become one of his most frequently heard songs. There is an anecdote about the song Barber himself often told. In 1979 Barber had just moved to a new apartment in New York City and needed to call home. He needed to contact Gian Carlo Menotti who was staying in the apartment. But Barber had forgotten the phone number and contacted the operator for help. She refused to give him the number, but then admitted that she was very fond of Sure on this shining night and asked Barber to sing the opening of the song to confirm his identity. Barber sang and got the number! Barber was a good singer himself but I wonder if he sang it as well as Stuart Skelton does on this recording. 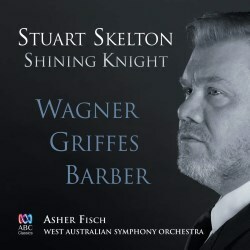 Anyway, this disc is a must for admirers of Stuart Skelton, of Wagner, of Griffes – and of Barber.